Author: Miklós Szalay. Series edited by: Rainer Voßen. The present essay is concerned with the phenomenon of the confrontation between expanding colonization and the hunting-gathering segment of the population of the Cape. Precisely what type of challenge did colonization present, how did the San react to the challenge, and what was the fate of the San after colonial expansion had overrun them? These are the questions the book seeks to answer. 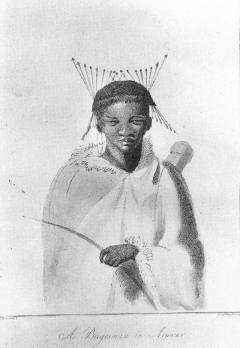 The San put up strong resistance to colonial expansion which had two goals: first, the seizure of the land, second, the exploitation of the indigenous people as labourers. Szalay sets out to sketch the mechanisms of the colonization of the San, illustrating his essay with photos and drawings. Szalay is concerned with the early contacts between the San peoples of southern Africa and European colonists, beginning with the late period of colonial expansion under Dutch rule, and continuing through much of the nineteenth century during the English colonization of the Cape. (...) Szalay’s credible and intriguing argument lays the groundwork for further study, challenging a number of accepted clichés of the historical literature that perhaps have limited research on the San in the eighteenth and nineteenth centuries. (...) In a very few pages, Szalay has expanded the significance of the San in Cape frontier and colonial life, more sharply highlighted the colonial goals of land alienation and cheap acquisition of labor, examined the question of acculturation in a colonial context, and asked the contemporary Coloured peoples to reacquaint themselves with a nearly forgotten branch of their family tree.